We’re delighted to be working with Memphis’ James and the Ultrasounds for the first time! On a given night in midtown Memphis one can find any number of bands. Amid the dim lights, heat and discordant blend of conversation emerging from venues like the Hi Tone, the Buccaneer Lounge and Bar DKDC there has been a particular group distinguishing itself over the course of the last year or so as one of the best up and coming rock acts in the city. Brash yet thoughtful, with sweet guitars and pummelling, yet danceable, Memphis-style rhythm. There isn’t quite anything like them in Memphis or elsewhere. If you happen to be one of those who haven’t yet heard James and the Ultrasounds, or seen them live… strap in. The four-piece rock and roll band is the brainchild of James Godwin, a familiar face in the Memphis music scene, having been raised in the Bluff City, playing bass in a number of bands since his teens. His time in experimental rock outfit The New Mary Jane offered him an opportunity to develop what now seems like a telepathic understanding with current Ultrasounds drummer John Argroves, as well as to collaborate with influential Grifters duo David Shouse and Scott Taylor. In the ensuing years Godwin again teamed with Argroves to form a powerful rhythm section for Goner Records legend Jack Oblivian as well as Memphis-by-way-of-Knoxville roots rock singer/guitarist John Paul Keith, whose 2013 Roland Janes-produced release Memphis, Circa 3 A.M. has been lauded as an instant classic. After touring with Jack O and JPK across the US and Europe, Godwin made time to do some songwriting of his own, and in 2012 recorded his solo debut EP, Lovers and Ghosts, playing all the instruments himself to a four-track recorder. Soon thereafter he put together a band to perform the EP material, bringing in Argroves on drums, Luke White on guitar and David Johnson on bass. The group began to play regionally and have strung together tours up the east coast to New York, returning to Memphis energised and ready to record new material that Godwin had been writing. This past spring the band planned some recording sessions with another great Memphis multi-instrumentalist, Mark Edgar Stuart, producing. The results of those sessions comprise the band’s MadJack Records debut full length album, Bad To Be Here. More recently, the band released a brand new 7-inch on a new Memphis label, Misspent Records. The 7-inch includes a brand new James and the Ultrasounds track, the hook heavy space-punk jam Robot Love on the A side, with the B side featuring a crunching version of The Cramps’ TV Set, from their Phillips Recording cut and Alex Chilton-produced Songs the Lord Taught Us. Look for new releases on both Madjack and Misspent in the coming months, including a special, short-run European press of two early James and The Ultrasounds cuts, Apocalyptic Love and I Get The Shakes. With these offerings in store for the coming months, James and the Ultrasounds are well poised to be one of the big breakout bands of 2016 and beyond. One way or another, be sure to keep an eye on this band. Support comes from Bobbie Peru. Bobbie Peru are an eclectic rock band formed by Robert Genovese in Manchester in January 2006. Bert is a singer/songwriter/guitarist who is originally from Waterbury, Connecticut, USA who was signed by Manchester label Storm. 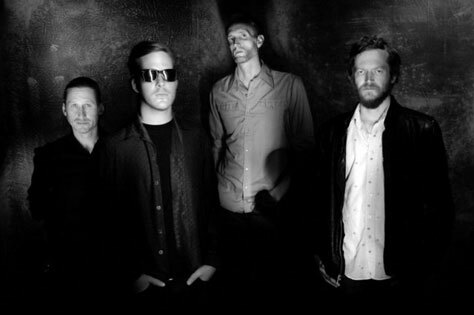 The band’s music is heavily influenced by indie, garage and post-punk movements. Their sound is an unpredictable mix of stabbing/distorted guitars, social commentary and an abrasive rhythm section.